As a part of the Short North Special Improvement District (SID), which is an agreement between property owners along the High Street corridor, the Short North Alliance provides a number of marketing and business connection tools to the businesses that fall within the SID boundaries. Though businesses that fall within SID boundaries automatically receive membership, the intent of the Friends of the Short North program is to be inclusive of businesses in the neighborhoods that surround the District but fall outside SID boundaries. Out of District members can participate and receive the same promotional benefits as offered to the SID, while also connecting with businesses in the District. Businesses that serve the District but are not adjacent to the District can become Way Out of District members, and will also receive the same promotional benefits and business connection opportunities as businesses within SID boundaries. The SID includes businesses along High Street from King Avenue to Ohio Center Way. Out of District businesses are located adjacent to the District, in such neighborhoods as University District, Arena District, Italian Village, Victorian Village, and Harrison West. 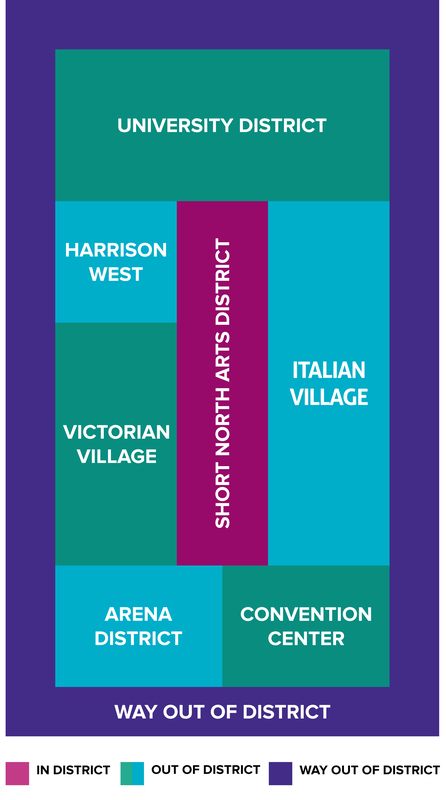 Way Out of District members are businesses that serve the Short North Arts District, but are located outside of the adjacent area. For more information or to become a Friends of the Short North member, email us at info@shortnorth.org.